Mr DP Skull Tool - DPx Gear Inc. The tool that comes with the DPx HEST/F 2.0 is now available for purchase separately. 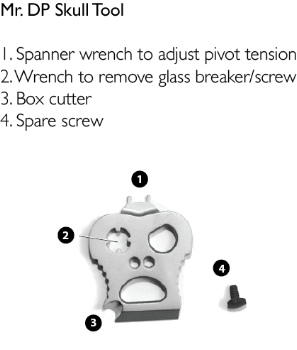 This tool is its own handy EDC and is designed to be used to adjust the pivot tension on any HEST/F 2.0 model and remove/replace the glass breaker screw with an included flat screw. The Mr. DP Skull Tool on its current form was originally designed to be used for adjusting the pivot tension on the DPx HEST/F 2.0 models of knives, but can be a handy EDC for other purposes. In addition to storing and removing the glass breaker or flat head screws to your knife, it can be sharpened and used as a box cutter or general sharp edge for cutting. The wedge end has chisel or scraping capabilities in a pinch, with handy grooves on each side to assist with gripping. There are multiple points to weave into a lanyard or use on a key ring so it is always handy and making a cool statement in the process. If you purchase a HEST/F 2.0 OD, you will get one of these handy tools, or feel free to now buy one separately while they are in stock and at a great price.